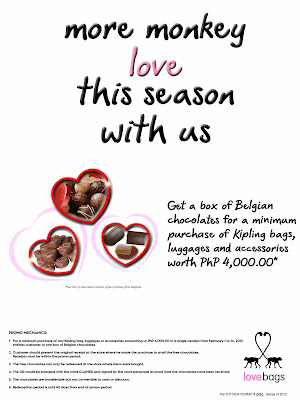 Enjoy a Belgian Valentine as Kipling gives away a box of premium, limited edition Belgian chocolates for a minimum single-receipt purchase of Kipling bags, luggage and accessories worth P4,000 from now until February 14, 2011. Simply present the original receipt at the store where the purchase was made to avail of the free chocolates. Aside from getting free chocolates this Valentine season, Kipling is also set to release its Spring/Summer 2012 Collection in stores. Now, you have the latest selection of bags that are effortlessly stylish, colorful and fun, as well as practical and durable enough for even the most active individual, making it the bag to have for virtually any season. Touted as the biggest bag brand in Belgium, Kipling was founded in 1987 and was inspired by Rudyard Kipling, author of The Jungle Book. Over the years, Kipling has evolved beyond its original roots of providing high quality backpacks suited for the adventures of daily life into a distinctive, worldwide brand offering a range of carryalls for a variety of lifestyles. It’s no wonder people the world over have fallen in love with Kipling bags. In fact, more than 35 million people around the world now own at least one Kipling bag. Experience a Belgian Valentine by visiting any of the following Kipling stores: SM Mall of Asia, SM North EDSA, SM Megamall, SM Bacolod, SM Iloilo, SM Davao, SM Cebu, Robinsons Place Ermita, Rustan’s Alabang Town Center, Rustan’s Shangri-La, Rustan’s Gateway, Landmark Makati and TriNoma. Oo nga. Ako, can't have chocs kasi madali ako ma sore throat. Gandang umaga, Levy! I also love chocolates...esp.when they are gifts, hehehe.